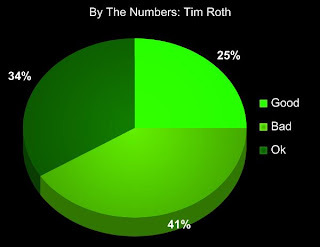 I was surprised to find just how many of Tim Roth's films I'd seen. I don't know if that's a good thing for an actor when I can't even remember you in half your films. Despite that I still like Tim Roth. He doesn't make a film for me, but I think he's quite enjoyable. Now then, quick explanation for those new as to how this all works. I take all the films an actor or actress has been in and break them down into three categories, 'Good' 'Bad' and 'Ok.' I do not count TV appearances or Made for TV movies. Afterwards a quick analysis will show whether or not they're a good actor by the numbers. Invariably there is a 2-3 +/- point bias on a person to person basis. Also, since 'ok' movies are not bad they count towards the positive column in the overall figuring. If by the numbers they fall in the 50 - 60% range, they're a bad actor; 61 - 70% good actor, and 71 - 80% great actor. Anything higher is unlikely, but bill be classified as "elite." As I said, I actually like Tim Roth. While many will point to his work in Reservoir Dogs, Pulp Fiction, The Incredible Hulk, or even his TV work, I opt to think of his role in Rosencrantz & Guildenstern Are Dead, a truly excellent, if not slightly bizarre, dramedy. But the numbers game, she be a harsh mistress, and with a 59% positive over 41% negative, he falls just short of the good column. Missed it by two points. Ouch. Thanks to Jerry for suggesting Tim Roth! I got several great suggestions last week and I'm now keeping a list going, so keep letting me know who you'd like to see in future editions and I'll get to them. That's a great one! I am glad you used my idea. After I mentioned him to you I went into IMDB and I too was surprised I had seen many of his films without realizing he was in them. Yey Jerry! Man, I want to get someone in there again too. Have you done Steve Buscemi yet? I know he was in Reservoir Dogs too, but still! He's from my hometown as is Ed Burns. So you're judging the film, not the actors performance in the film, right? Have you done Kevin Costner? Or Drew Barrymore? Or Ashton Kutcher? Yeah R-dogs is his best role. But didn't he receive praise for the Madness of King George as well? Jerry, I know, he just kind of slips into everything. Ally, I love Buscemi, I will add him to the list. Copy, I think that might have been someone else. I don't recall seeing it when I was going through his list of credits. I've heard the name, I recognize the face, but if you had given me the name and a few pics to match it to... wouldn't have known him.